On Sunday November 18th, TampaBay area residents were introduced to pickleball for the first time at the Cheval Athletic Club in Lutz, FL. Ambassador Larry Neely, a resident and avid tennis player at Cheval, hopes to add pickleball to the Club's athletic schedule, open to the public and to players of all ages. Larry himself is new to the game - so wants to extend special thanks to fellow ambassadors, John Hilliard of New Port Richey, Lee Boerckel of Hudson, and veteran player Bob Cicetti of the Long Center in Clearwater for being there to help him out. 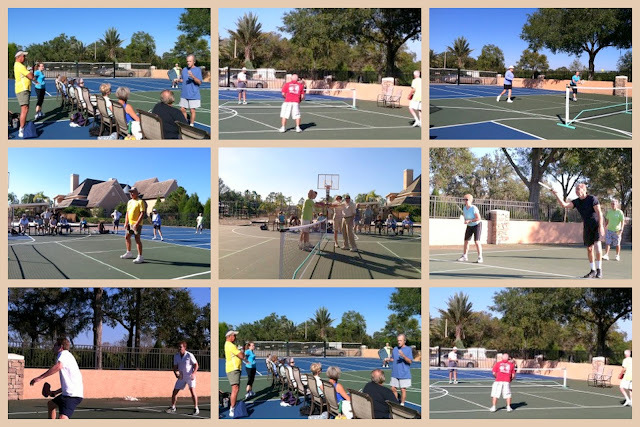 Twenty two people learned about pickleball, first with an orientation that talked about the game and introduced them to the paddles and balls. Then they had an opportunity to take to the courts for instruction and play. The club is working on scheduling times for open play - so we should see this listed on our places to play page pretty soon. Larry also has a large supply of paddles and balls available for sale to interested players. Next is to take his portable nets on the road to surrounding communities in New Tampa, (Tampa Palms), Heritage Springs (Trinity) and to Tampa's MP Tennis and try to introduce a TampaBay Pickleball league.